Our art is born from our partnership. Together we are the creators of all that surrounds us. Early on in our relationship we identified our inspiration which has led us on our spiritual journey. Glass is one outlet that represents who we are; it is the perfect medium for our expression. We start with the fiery, molten mass of ideas that quickly begin to take form. It is through careful skill and breath that allows our creation to grow. We pass the piece off to the other and give over trust; as partners we depend on each other. We allow our intuition to guide this fluid medium to its final state. From here, new ideas arise and new directions emerge. 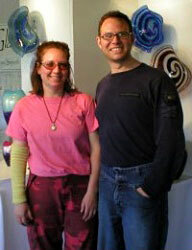 Douglas and Renee met in 1993 and began blowing glass together shortly thereafter in Minneapolis at a community college. In 1995 the couple transferred to the University of Wisconsin at River Falls, where they completed their training in glass. They married in 1996 and, while traveling to Venice for their honeymoon, they discovered a unique part of their heritage. During a very short layover in Chicago, a ticket agent commented on the couple’s last name; she told them about a Sigwarth Glass Factory in Hergiswil, Switzerland, where three members of her family worked. This came as a huge surprise to the couple who later discovered that glass blowing had been a Sigwarth tradition as far back as the creation of the family name which they were pleased to discover means “maker of light.” When Douglas’ great-great-grandfather Ludwig brought his family to the United State in 1850 from Germany, glassblowing left this line of Sigwarths, but only for a short time. Douglas and Renee revived a tradition of beauty with vitality and passion. 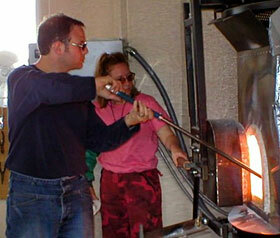 In 2001, the Sigwarths opened their own glass studio in rural River Falls, Wisconsin, in the St. Croix Valley. The Chicago Tribune labeled the Sigwarths a part of “The New Wave; Tomorrow’s it Artisans” (November 30, 2003). The Sigwarth’s creations combine elegant forms with vivid, rich color. The beauty of their glass is timeless and it will add life to any décor.